"Use a vegetable peeler or spiralizer to turn carrots into gluten-free fettucine-like noodles, then top with a luscious sauce of white wine, cream, peas, ham, and butter." Use a vegetable peeler to shave carrots into fettucine-like strands. Heat butter in a large skillet over medium-high heat; when foam subsides, add onion and ham. Cook and stir for 3 minutes. Add carrot strands, garlic, and wine to the skillet with the onion mixture. Reduce heat to low and cover. Cook, stirring occasionally, about 10 minutes. Add cream and peas to the skillet. Bring the mixture to a boil. Reduce heat, cover, and simmer 5 minutes more. Stir in mustard, salt, and pepper. Cracking the secret family recipe. This was awesome! I will say though, to keep it lighter I used green yogurt instead of heavy cream and 2 tablespoons of light cream cheese. 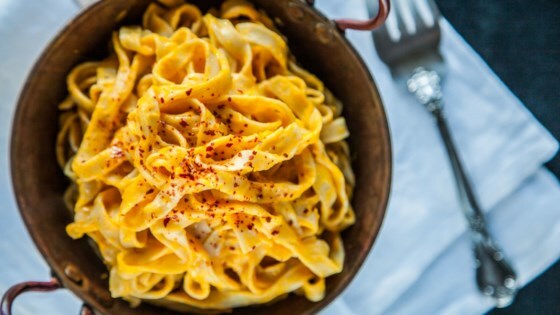 This is a great alternative to traditional pasta! !